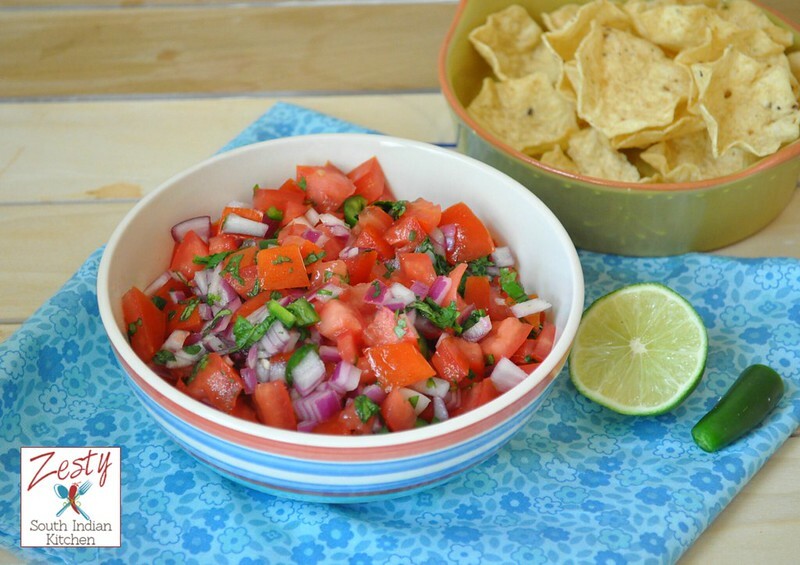 Delicious and colorful Pico de Gallo goes well with sea food recipes and steak. The weather in Houston is turning into perfect summery that is what my daughter says, yes hot sun. I love these sunny days, even though there is heat, I can do lot of things especially like making sun dried chips and so on. I need to gear up and make some for this year. My current favorite is cooking Mexican recipes. Yes I was always fond of them, but going to Mexican restaurant is impossible with two little ones. So trying it out at home, and I made this Pico de Gallo which is so easy and amazed that it has only few ingredients. This Pico de Gallo recipe is adapted from the book Salsas and Moles: Fresh and Authentic Recipes for Pico de Gallo, Mole Poblano, Chimichurri, Guacamole, and More by Deborah Schneider. In this book author clearly explains the different salsas, mole and other sauces used in Mexican cooking. First two pages are about introduction of salsas, according to Deborah, salsas are important side dishes or entities with specific uses, it is either added as a last minute flavor enhancer or to provide heat to dishes or there is chunky fruit salsa which can stand alone with snacks. Then it is followed by myth about salsas, and the seasoning and elements for salsa flavor and balance; and followed by different type’s chilies and working them etc. Salsas and Moles book consists of 5 chapters, first one is classic table salsas, which include salsa verde, salsa diabla (fresh tomato salsa with chipotle) Salsa xoconstle are few. Then next one is the hot salsas with heat index. I love that part. I haven’t tried any of the recipes, but as a lover of hot dishes I will. The hottest being Habanero salsa with heat index of 8 +. On the lesser side is the Mayan hot salsas with heat index 5. Third chapter is about Mole and Enchilada sauces. You can find simple enchilada sauce and mole sauce and also there is recipe for three chile salsa boracha and Mole verde. Fourth chapter is on salsas for tacos with Basic Guacamole, salsa mestiza (Avocado-cilantro sauce) , chimichurri and Pico de Gallo, which I tried and fell in love with it. There is recipe for pickled carrots and jalapenos too. Last and fifth chapter is about chunky salsas and Botannas which include unique veggies and fruit combinations like Mango Habanero salsa , Jicma and Radish salsa with orange and chile are few. What I like about this book is its simplicity and the recipes are easy doable. You may need a few authentic things to make delicious salsas and mole. I think it is a good book to have if you are looking to make your dinner or snack time special. Only thing I found difficult is that font is small and that can make it difficult to read. Also some of the recipes lack the final pictures and if every recipe has the pictures then it will be really wonderful. I tried Pico de Gallo from this book, I followed the exact recipe expect that I used salad tomatoes instead of roma tomatoes mentioned in the recipe. I bought a large batch of salad tomatoes as it was only 69 cents per pound. I used red onion; you can also use white onion too. I found that it is delicious just as such. You can serve them with sea food or steak. Indian friends it is really good to go with our chapathi/roti. 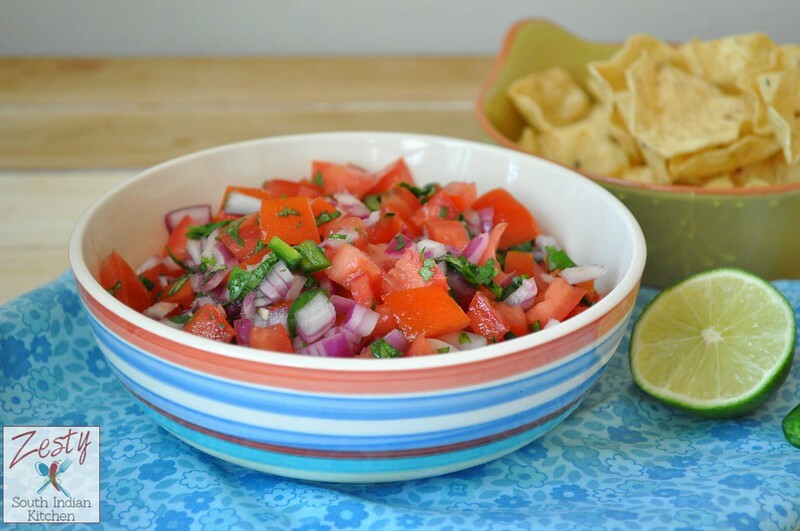 Next time you can make this Pico de Gallo instead of simple salad you make; it will go along with roti or rice. Delicious Pico de Gallo makes your seafood or steak recipe more delectable. Even have it as salad. Combine all the ingredients in a bowl, taste and adjust the seasoning as desired. Swathi i am a salsa fan but other salsas can be served only with chips aprat from this one.Loved your review,Don’t know these many salsas exist .Hope we get more recipes from the book. yummy salsa and nicely done with loads of information….Great work Swathi …. Simple and cool salsas with variations make perfect snacks specially in summer..
My all time favourite salsa………..can have it any time.looks lovely. Delicious salsa, yummy with some tortilla chips..
love it,perfect witb chips ! I make something similar but without lime juice – will try it next time! 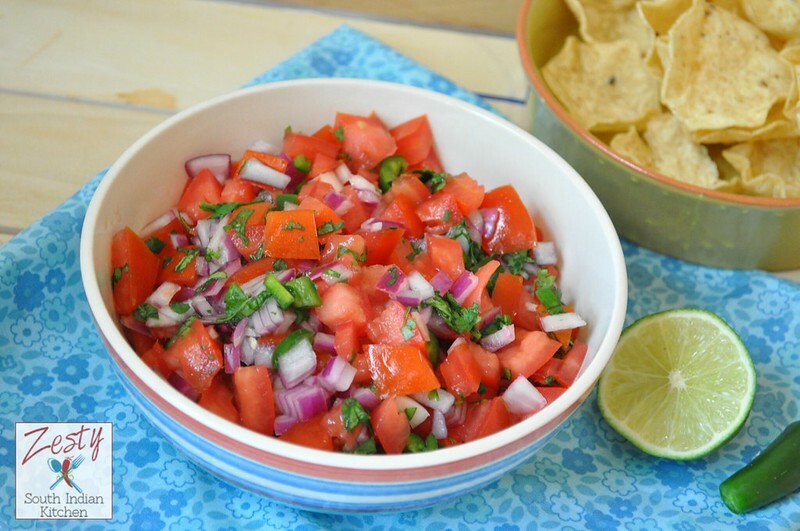 Salsa looks refreshing and delicious!